12/1/14 The Blasted News with Meria. 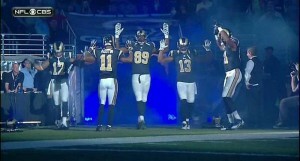 Cops pissed at the Rams “hands up don’t shoot” (if they weren’t in uniform they’d be targets too); Earthquake in Sedona, Arizona; mud to drink in Sao Paolo; Calif. drought;Cape Verde Volcano taking town;Japan volcano blows;all security hit in 2014;another $82 million for Israel;drones kill indiscriminately while Obama condemns violence in Ferguson;Ferguson eyewitness dead;steering the jury with unconstitutional “law”;McCullough fund raiser for cops;Wilson resigns with $500,000; flu vaccine in Italy kills seniors;Christie and pigs;another Wall St whore for admin;brains missing in Hanford babies;Fukushima radiation in Florida crops;illegal to feed homeless in “christian” America;oil spill in Canada;white people riot for stupid reasons;Eliz Lauten resigns after slamming Malia & Sasha;walking with hands in pocket while black in Michigan;protests arrests throughout country;Hosni Mubarak freed;UN to US on civil rights and CIA;Kareem Abdul-Jabbar on Ferguson;seafood gone by 2048?10 fattest countries in the world – we’re #1; Honda cover up;war on women continues-some solutions;demonizing Michael Brown;cop shoots out pregnant woman’s eye with beanbag;The Ayatollah on Ferguson and US hypocrisy;woman shot in head by cop for honking;blacks protect white biz in Ferguson-no media. Information you don’t get anywhere else – commercial free. Subscribe to access entire site 24/7. Commercial Free, all downloadable.